Lanificio Figli di Silvano Cioni – di Franco e Enrico Cioni & C. s.a.s. di Franco e Enrico Cioni & C. s.a.s. The textile mill Lanificio Figli di Silvano Cioni sas was founded in Prato in January 1976 for the production of fabrics in carded wool designed mainly for womenswear. The position of the company on Italian and foreign markets followed the pattern of most of the textile mills operating in Prato, which are generally family owned and operated: succeeding generations ensure a smooth continuation of the original philosophy. Indeed, Lanificio Figli di Silvano Cioni applies and develops the principles of its founder, who worked all his life to create a structure that would provide his children with their mission: textile innovation. In the first years of its business, the company used wool and noils of mediumfine quality to produce woollen coating fabrics in a variety of weights, as well as a wide range of velours. In the Eighties, the mill undertook a gradual process of expanding the range of products, adding worsted fabrics in wool to its collection, and using new fibers like linen, cotton and viscose. In this way, the types of fabrics produced changed gradually in both structure and weights: this created the conditions for producing summer collections. The company also follows the market trends to create fabrics that can also be used in menswear. While continuing to operating with an eye on innovation, not only from the technological point of view, but as the general company philosophy, Lanificio Figli di Silvano Cioni has adapted to the conditions imposed by the market, applying important strategic choices made to satisfy the clientele, in terms of both fashion content and service. Lately, the “total look” orientation of the clientele and the increasing insistence on quality has prompted Lanificio Figli di Silvano Cioni to develop a range of one- and two-way stretch fabrics and jeans fabrics in line with the company philosophy. Copyright © 2019 Lanificio Figli di Silvano Cioni di Franco e Enrico Cioni & C. s.a.s. 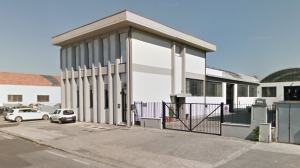 - via Campostino di Mezzana, 4 - Prato (PO) - 59100. Tutti i diritti riservati.